Remember a loved one during the holidays with a beautiful pillow. 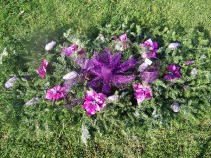 Pillows can be placed directly on the ground in front of the grave marker or they can be placed on an easel. They come with two stakes for the ground and easel would be extra. Price point three would include an easel. Price point one is without pine cones. This beautiful Full Pine Blanket is a wonderful way to honor a loved one during the holiday season. The one pictured is a full blanket which is 3 ft x 6 ft. Half blankets are also available. Blankets come with stakes to keep them secure. Price point one is with a bow only, price point two includes pine cones and price point three includes flowers and pine cones and is the one shown. Ribbon color can be changed to Burgundy, Blue, or Purple. This beautiful lavender and purple full blanket is a lovely way to honor a loved one who's favorite color was purple. This blanket is 3 x 6 but can also be done as a half blanket. (call for pricing) Price point one is with bow only, price point 2 is with the bow and the white/glitter tipped pine cones and price point three includes the pine cones and poinsettias. Poinsettia color may vary (purple or white) depending upon availability. 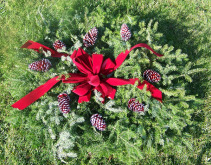 Honor a loved one during the holiday with a fresh pine blanket. The one pictured is a half blanket which is 2 1/2 ft by 3 ft. Full Blankets are also available. Blankets come with stakes to keep them secure. Price point two includes pine cones and price point three includes flowers and pine cones. The Velvet Ribbon color can be changed to Red or Purple and the silver can be changed to gold. 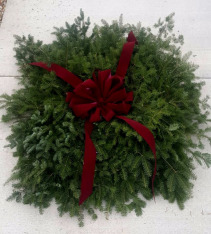 This beautiful Full Pine Blanket is a wonderful way to honor a loved one during the holiday season. The one pictured is a full blanket which is 3 ft x 6 ft. Half blankets are also available. Blankets come with stakes to keep them secure. Price point one is with a bow only, price point two includes pine cones and price point three includes roses and pine cones and is the one shown. Ribbon color can be changed to Burgundy, Blue, or Purple. 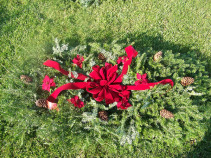 This beautiful Half Pine Blanket is a wonderful way to honor a loved one during the holiday season. The one pictured is a half blanket which is 2 1/2 ft x 3 ft. This one has Red pine cones tipped white or gold depending on availability. Full blankets are also available. Blankets come with stakes to keep them secure. Price point one is with a bow only, price point two includes pine cones and price point three includes flowers and pine cones. 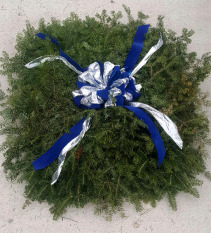 Ribbon color can be changed to Burgundy, Blue, or Purple and pine cone color can be changed to match the bow. Remember a loved one during the holidays with a beautiful pillow. This pillow is decorated with red pine cones, holly and berries. Poinsettias can also be added. Pillows can be placed directly on the ground in front of the grave marker or they can be placed on an easel or a monument clamp. They come with two stakes for the ground and easel would be extra. Price point two would include an easel or clamp. Price point three includes flowers and comes with stakes.